The world was a different place back when the author was growing up, but he had a very unusual upbringing. He grew up moving around Europe and America, a lot of the time without his immediate family. He lost his mother at a rather young age and seemed to be required to be mature long before most of us. The level of detail in which he describes his life was both interesting and tedious at times for me…and sad. When he found faith, he was all in and determined to lead his life with faith. I thought the first part of the book really read like a novel and moved along. Perhaps it was how fast his young life moved. Once he found faith, I found the level of detail too much for me and found myself skipping ahead. This article was published on Sep 15, 2018 . 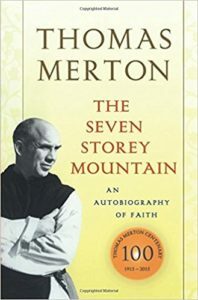 It is tagged The Seven Storey Mountain, Thomas Merton. You can follow any responses to this article through the comment RSS feed.